"Gimme a great big smile!" And who could resist such an invitation! 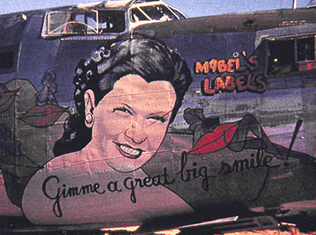 Another amazing creation by Bartigian which adorns the entire nose on one side of the B24 with a superb portrait of his young wife Mabel and a series of graphic lipstick kisses and beguiling nudes -- any one of which would have been considered enough on most embellished planes. 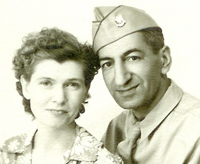 Never one to hold back, Sgt Bartigian just kept on painting and filled his entire "canvas". Many aircraft around the world were adorned with portraits of loved ones, wives, sweethearts, children.... none of them were greater than this magnificently huge tribute to the artist&apos;s young bride. Here was a man who clearly enjoyed his work!